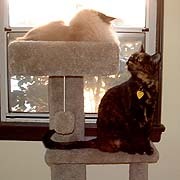 This cat tree just rules. 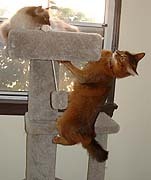 I climb up it in leaps and bounds. Sometimes I bound up it only to find that Boodie has taken up the top perch. She’s up there all the time and it really isn’t fair. I mean, she’s huge so she takes up the whole perch. There’s no room for either me or Binga when she’s up there. It’s getting really annoying. Binga has been pretty laid back about it up until now, but just wait… I can tell her patience is going to run out soon. We were so intrigued with our Christmas cat tree that we almost didn’t notice that our humans had packed up and left town for the holidays. 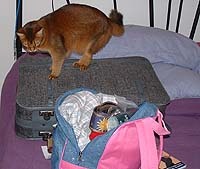 I was wondering what that big gray thing was that Binga kept sitting in. My human got Binga out and put a bunch of clothes and stuff in it. I was bummed — she got it filled and zipped up before I even got a chance to hang out in it. We didn’t really miss the humans all that much. Some girl fed us and she seemed pretty nice. She said I was soft and friendly. Well, you’d be friendly to a stranger too if you knew she was your only easy food source! 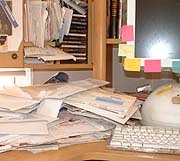 My human was worried that us cats would create havoc while she and her boyfriend were gone, but all we did was knock all her mail and monthly statements onto her desk. 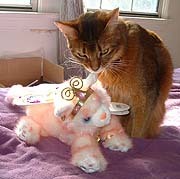 (Actually it was Binga’s work — she was looking for a toy and thought it was hidden there.) And her desk is such a mess that she didn’t even notice at first. I thought my human might bring us back something special from her trip. She went to Maryland and I hear they’ve got cool crab stuff. 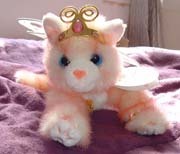 But all she had when she walked in the door was a really stupid plush fairy cat that she bought at the airport. I think the thing is evil. 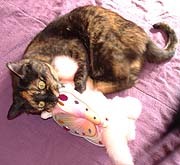 Binga tried to destroy it before it gave the whole house bad vibes. Unfortunately my human took it away from her. It’s always cold downstairs in the winter, so the humans decided to build a fire in the fireplace. That was fascinating! I’d never seen anything like it before. Judging from Binga’s nonchalant attitude, she’s seen this fireplace thing a few times. Dumb Boodie wanted to climb in the fireplace and play with the flames. I guess that’s why the humans have a screen — to keep out Boodie the Walking Fire Hazard. The stupidest thing my human did this month was try to dress me up. After the Christmas hat debacle, she wasn’t going to attempt anything too fancy, but she has a cat collar with a fake rose on it. She wears this herself as a choker sometimes, but she wanted to put it on me. The funny thing is it fits us both — she has a scrawny neck for a human, so it fits her on the last hole. I have a scrawny neck for a cat so it fits me (loosely) on the very first hole. Frankly I didn’t like it. I am pretty enough and gaudy adornments do not enhance my appearance. My human thinks I look cute in this picture. I was actually trying to nail her with a left hook.